DNS has identified protein targets for drug discovery in two complementary ways. The first approach was to develop a high-throughput cell-based assay to screen for compounds that modulated a CRE-luciferse reporter gene in human neuroblastoma cell lines. From a 180,000 compound library, hundreds of confirmed hits were found and 10 with novel structures were selected for further study. Biochemical analyses revealed that 8 out of 10 of these compounds were inhibitors of PDE4, and one was an inhibitor of MAO-B. The second approach was to use DNA microarrays to identify genes that responded transcriptionally during long-term memory formation. GlyT1 and most of the novel targets derive from this approach. HT-0712 originally was licensed from Inflazyme Pharmaceuticals Ltd. and now is wholly owned by DNS. Early preclinical studies established that HT-0712 enhances long-term memory formation in various animals while producing minimal emesis, which is a common side-effect of other PDE4 inhibitors. Ongoing medicinal chemistry efforts at DNS have identified other chemical scaffolds to advance as BackUps to HT-0712, one of which now is in Phase 1 studies. In addition to its role in memory formation, PDE4 has been implicated in various clinical conditions, including depression, neuroprotection and COPD. Because of the role of dopaminergic signaling in the formation of long-term memory, DNS is developing a highly selective, reversible inhibitor of MAO-B. Clinical studies of the lead MAO-B inhibitor, HT-3951, are underway. A back-up compound has been identified. As mentioned above, GlyT1 was found by DNS scientists to be transcriptionally regulated during long-term memory formation. Traditionally, GlyT1 also has been viewed as an interesting target to modulate glutamatergic transmission. A GlyT1 Lead is in preclinical development with a target IND filing date of mid-2015. A BackUp compound is anticipated to reach the preclinical development stage by 4Q 2014. DNS continues its efforts to find highly selective GABA-A inverse agonists. Ongoing neurogenomic research at DNS has identified hundreds of Candidate Memory Genes (CMGs) that are transcriptionally regulated during long-term memory formation in fruit flies and/or mice. Several of these (Novel 1-8) have been confirmed to be negative regulators of long-term memory formation via genetic experiments. 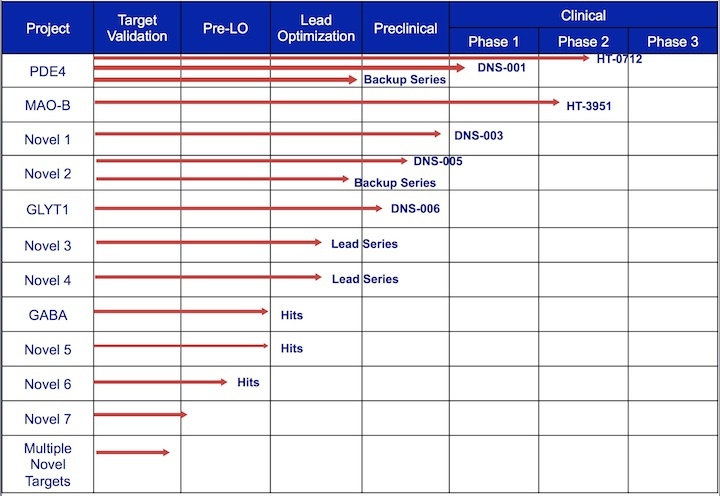 Leads from two of these projects have entered preclinical development, while the remaining six are at the lead optimization (LO) or pre-LO stages of discovery chemistry. These emergent drug candidates are likely to be first-in-class "plasticity modulators" that can be used to treat many types of cognitive impairment which derive from neurodevelopmental disorders, neurodegeneration, brain injury or age.